Are you ready for stunning elegance at its finest? 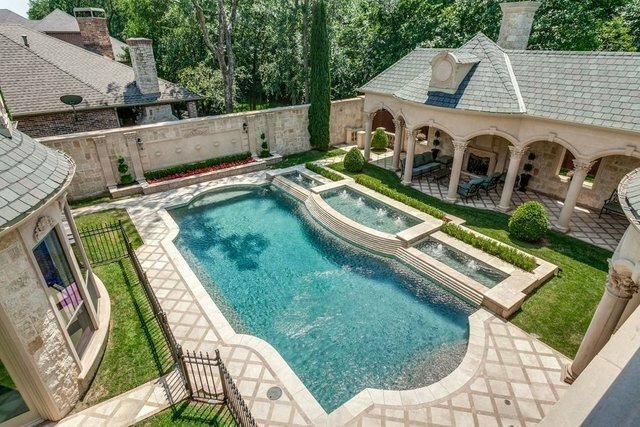 This amazing home does not disappoint! From high-end finishes and attention to the tiniest detail, this home defines elegance.A slate driveway and a grand facade of Austin and cast stone welcomes you and gives you a foreshadowing of what's to come. The formal entryway of this home is a sight to behold with elaborate plaster moldings and ceiling, led accent lighting, a gorgeous dome, and marble finishes which are the icing on the cake.All eyes are on the stunning floor to ceiling marble fireplace standing center stage as you enter the formal living area. Guardian ClimaGuard Low-E windows with motorized blinds give way to magnificent backyard views just beyond. Dark wood paneling wraps the sophisticated study in rich warmth.As you relax by the fire in the oversized master retreat, you will enjoy stunning views of the private serene backyard. The master bath boasts a shower, steam room, jacuzzi tub, and separate vanities. The master closet is beyond perfection with glass front cabinets and LED lighting. Just on the other side of the closet is a secret room, currently used as an exercise room, but the possibilities are endless!You will feel like a celebrity in the recently renovated kitchen. It includes two Subzero refrigerators, r/o water filtration, a Miele dishwasher, a built-in and plumbed Miele coffeemaker and a new Wolf gas griddle range with 18” Best LED down vent. The countertops are Taj Mahal Quartzite and the Mother of Pearl mosaic backsplash is mesmerizing with its iridescent glow.Three-zoned Schulter heated flooring in the casual living area downstairs and kitchen is another well thought out idea by the homeowner. Luxury at its finest!Upstairs there are three bedrooms, 2 baths, including a Jack and Jill bath, and huge closets/storage. The media room is state of the art with power curtains, seating for 10, and phenomenal sound. The game room has a separate living area and bar with a large balcony overlooking the pool.The four-car garage has epoxy flooring, tons of storage and its own bath. Private guest quarters above the garage have a separate entry and include both bedroom and a full bath.The private backyard paradise has a pool with gorgeous fountains surrounded by inlaid travertine marble, gazebos, a fireplace, multiple entertaining areas, along stone privacy wall and views from many areas of the C-shaped house. It is gorgeous, prestigious and words cannot fully describe it.The home is on a large lot, .46 acres, has radius gutter, two tankless water heaters, and many, many more bells and whistles to make living here a wonderful experience. You must see this one-of-a-kind elegant home to believe it. It is nothing short of amazing.